The Traktor Duo software is the centrepiece of the Traktor Scratch Duo bundle. Native Instruments has announced the almost-immediate availability of Traktor Duo and Traktor Scratch Duo - cutdown versions of Traktor Pro and Traktor Scratch Pro respectively. As their names suggest, both of these DJing solutions are based on two decks rather than four. Traktor Duo is the software-only option, while Traktor Scratch Duo also ships with the Audio 4 DJ 24-bit/96kHz audio interface to enable time-code control. NI says that Traktor Duo incorporates many of the advanced features you'll find in Traktor Pro. It offers, among other things, auto-syncing, looping, and integrated EQs/filters. Owners of both this and Traktor Scratch Duo will be able to upgrade to Traktor Pro for a discounted price. Both products will be available from 1 April. 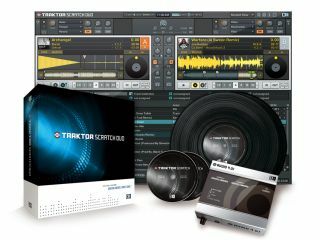 Traktor Duo costs $119/€99 and Traktor Scratch Duo is priced at $399/€349. Check out this demo of Traktor Scratch Duo from DJ Craze and DJ Klever.